Resident Brianna Arena, right, serves dinner to fellow residents at the Union Gospel Mission shelter. Six women in one room. The drama. The bad attitudes. The bad language. Stolen cigarettes. "Borrowed" money. "This must be what jail's like," she thought. Mary Helen Bartch is 57. She's been living at the Union Gospel Mission Crisis Shelter for Women and Children for four weeks now. Personal legal troubles brought her back from retirement in Florida. Her hair is rust-colored and graying. Today, she's wearing her favorite pair of Old Navy blue jeans; they're baggy and ripped in the knees. She speaks like she's telling a secret. "The day I walked in here, I was humbled. I cried," she says. "I know God put me here for a reason." This is a first for Bartch. In her past life, she was a translator for Stars and Stripes newspaper in Japan, a military wife and stay-at-home mom. In Spokane, she volunteered for the Red Cross and Hope House. She was always taking care of other people. But now, for the first time, people are taking care of her. "What happened that I have to be here? What has gone so wrong? What have I done so wrong that I have to be here?" she says, choking on tears. "I have my days, but you know, I just keep doing what I got to do. The little engine that could." The shelter used to be the old Budget Saver Motel, where serial killer Robert Lee Yates would come by a couple of times a month, pay for a room in cash and hire working girls for the night. Today, the walls throughout are replete with Biblical verses and inspirational stickers, reminding women of the power of patience, perseverance and prayer. The sign above East Sprague reads "HOPE STARTS HERE" with "VACANCY" glowing in red neon letters. There are 15 rooms behind the security gate, each with six bunk beds. To deal with capacity issues, every night before 10 the floor of the main hall is covered with thin, nylon-covered mattresses. 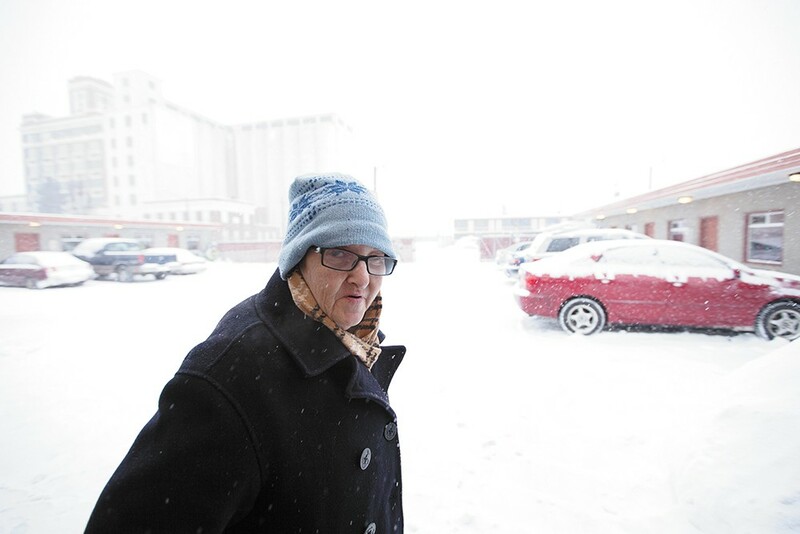 Resident Mary Helen Bartch at the Union Gospel Mission. Homeless women are the fastest growing population among the people the Union Gospel Mission serves. The Bible-based nonprofit is currently looking for a property to build a new, larger shelter to house the women more comfortably. The crisis shelter is the only place in town that takes women and children other than the Salvation Army Family Emergency Shelter, where there's always a waiting list for a room. Four years ago, the crisis shelter operators instituted a new policy in which they would no longer turn any woman away. Come high, come drunk, come off the streets. They will find you a mattress and pillow on which to lay your head. Their numbers doubled. "We started playing human Tetris," shelter director Rich Shaus says. In 2010, they were taking in an average of 122 women and children a month and about 42 guests a night. A year later, those averages jumped: about 326 women and children every month and 72 people on any given night. This February alone, the shelter served more than 400 people, sleeping an average of 95 each night. Shaus expects those numbers to grow. "Sometimes it gets claustrophobic ... If it wasn't for the roommates that I have, I'd probably go nuts, honestly," says Leah Miller, a shelter guest assistant, chuckling. Miller is 25, with big eyes, a broad smile and blue hoodie pulled over her head of thick, dark hair. This is her fifth time here, and hopefully her last. She's more than two weeks sober and two years clean from drugs. Her addiction started when she was 21, after she watched a little red Toyota truck careen into the median on I-90 near Stateline, straight into her best friend. It was after 9 pm on May 13, 2009, and raining hard. Ally was killed on impact. After two years of using drugs — mushrooms, pot, meth, cocaine — she checked into the crisis shelter when her car was stolen in a drug deal gone wrong. It's provided some respite. "I think I've laughed here more than I [ever] have," Miller says. Shaus blames absent fathers for the shelter's rise in numbers. More moms are checking in with more kids than before. "There's an overall community crisis," Shaus says. "More and more, the family has been degraded." But the factors that contribute to homelessness among women are likely much broader. Jerry Jones, the executive director of the National Coalition for the Homeless, says "mental illness runs disproportionately high" in homeless single women. For women with families, housing costs are the primary drivers. 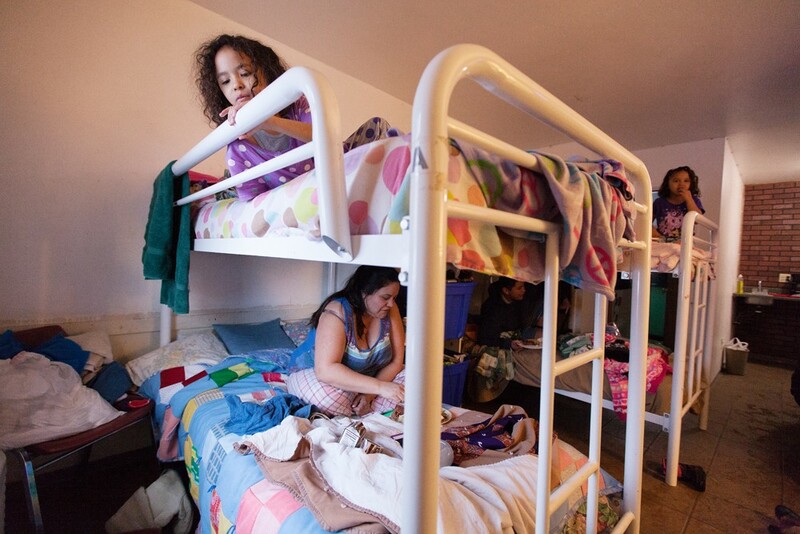 Seven-year-old Savannah Owens, top, and her mother, Elizabeth Vasquez, eat in their room at the Union Gospel Mission Crisis Shelter for Women and Children. "We have this catastrophic failure of our social safety net and mental health care system and other means of support to help people in crisis," Jones says. "The services available to homeless people are woefully inadequate." According to a UGM survey, nearly 60 percent of its guests at the women's crisis shelter have experienced mental illness and a little less than half have struggled with addiction. About three-fourths say financial problems led to their homelessness. More than 40 percent point to domestic violence. On Sunday evening, Robin Crane, a grandmotherly woman in a red turtleneck and chunky knit sweater, leads a group of six woman around a circular table in the Gathering Place. She's a volunteer from Abuse Recovery Ministry & Services, a religious-oriented counseling program for survivors of domestic violence. Tonight she's talking about boundaries, about women who don't set boundaries, who are used. The women around the table nod. A small, charismatic woman wearing two cardigans and a Tiffany's bracelet dominates the conversation. Like Mary Helen Bartch, this too is a first for her. She has a bruise on her left cheek from where her son's knuckles struck her face. When she pulls at the neck of one of her sweaters, she reveals a half-dollar-sized shiner on her chest. "Why did I allow that? I just hate myself for allowing that," she says. This is M. That's the first initial of her first name. She doesn't want her son to know she's here. Despite the marks on her body, she loves him unconditionally, her flesh, her blood. She doesn't want to ruin him. M checked into the shelter last week. During her first few nights here, she was up all night, fueled by anger and pain she hadn't felt for years. "I feel! I feel hurt! Before I was feeling nothing! Nothing! No hurt. Nothing. I was like a dead body just walking," she cries, slamming her fists on the table. "Now I'm beginning to feel something. I'm not a shell. I'm alive," she whispers.